Number of points for the new 450SX points leader, Eli Tomac, through five rounds. Tomac had 63 points after five rounds in 2018, 94 points after five rounds in 2017, and 88 points after five rounds in 2016. 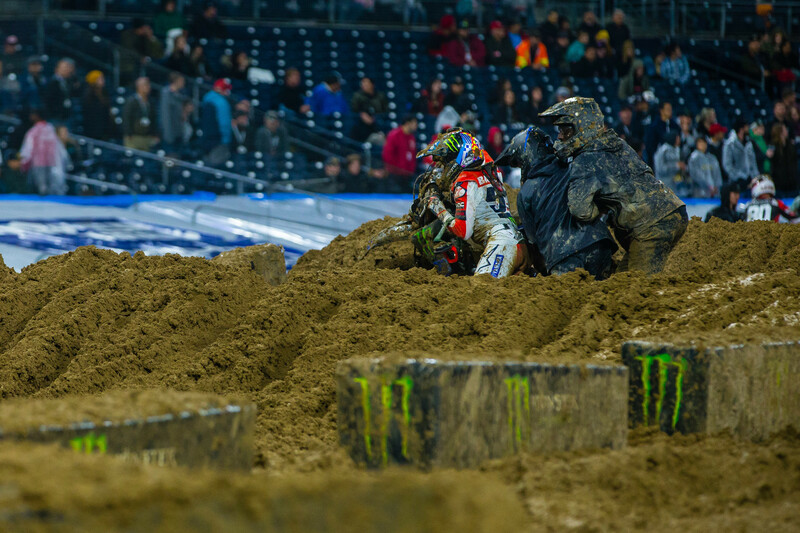 Points separating the top four riders in the 450SX Class, which doubled the top-four gap going into San Diego. Points separating the top four riders in the 450SX Class after five rounds in 2018. 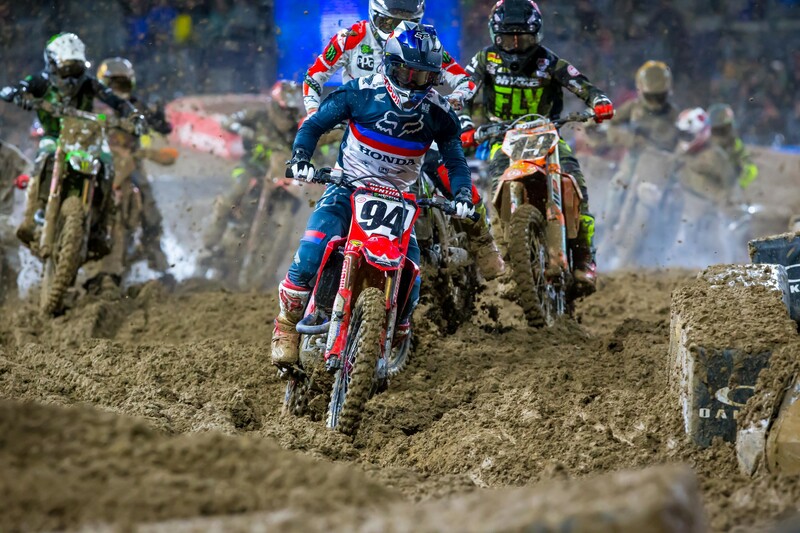 Number of 450SX machines that have had the red plates this season heading into round six. 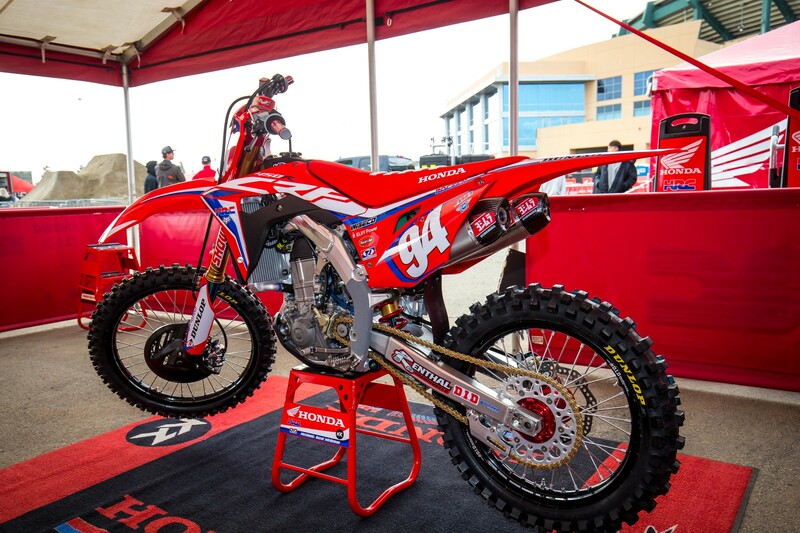 Jason Anderson brought them to Anaheim 1 (as the previous season’s champion does), Justin Barcia rocked them at Glendale, Ken Roczen had them for Anaheim 2 and Oakland, Cooper Webb’s KTM had the red plates for San Diego, and now Eli Tomac will have the red plates at Minneapolis this weekend. 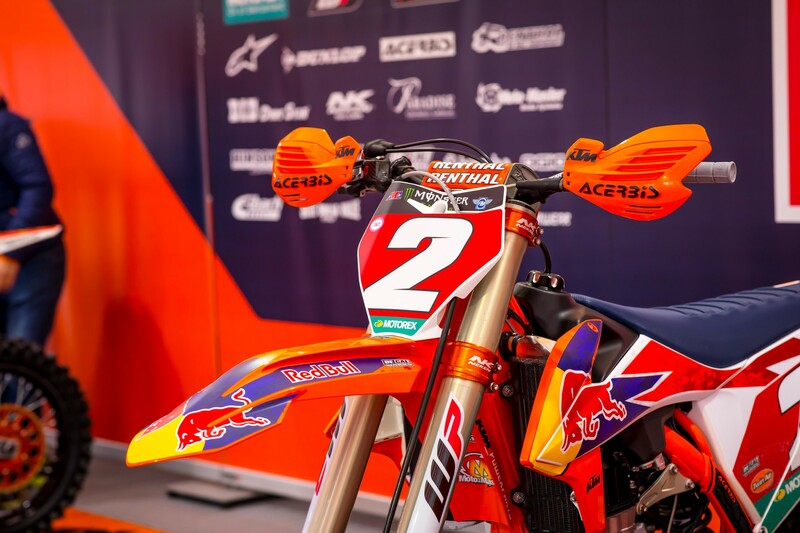 Number of 250SX riders who have had the red plates this season. 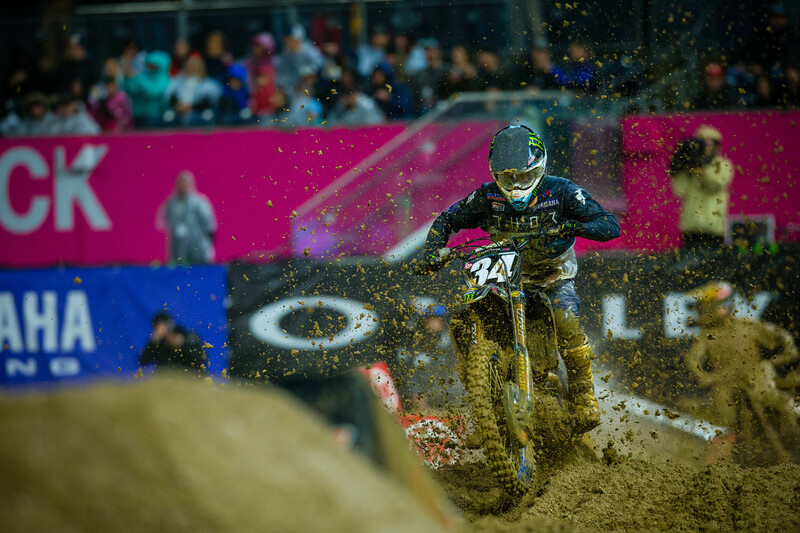 Colt Nichols took over the red plates after Anaheim 1 and had them for Glendale, A2, Oakland, and San Diego, but now Adam Cianciarulo has moved into the points lead on his Monster Energy/Pro Circuit Kawasaki. Nichols finished 10th at San Diego. Points separating the top four riders in the 250SX Class, as Cianciarulo has 114 and Ferrandis (fourth) has 102. RJ Hampshire, who currently sits in fifth, has 75 points. 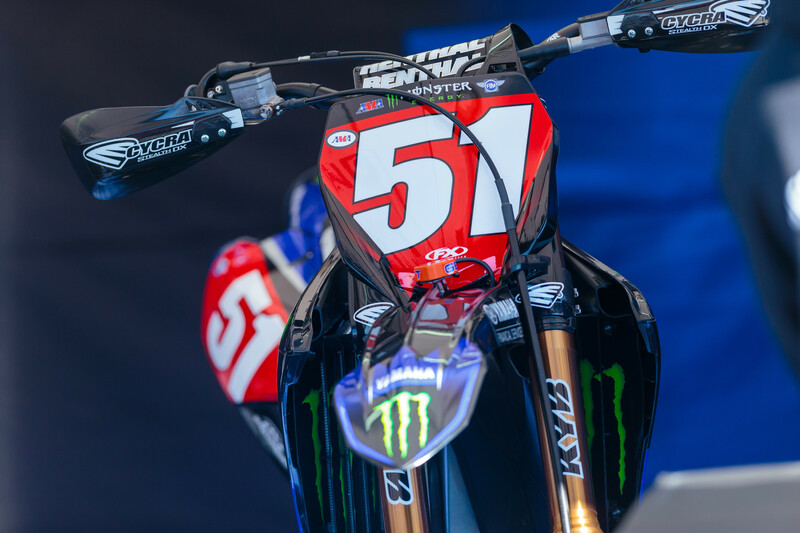 Number of Yamaha riders who were in the top three in their respective main event until they suffered bike problems: Monster Energy Factory Yamaha’s Justin Barcia was in third on the second lap before he had to push his bike off of the track and Monster Energy/Yamalube/Star Racing Yamaha’s Dylan Ferrandis was in second on the fourth lap. 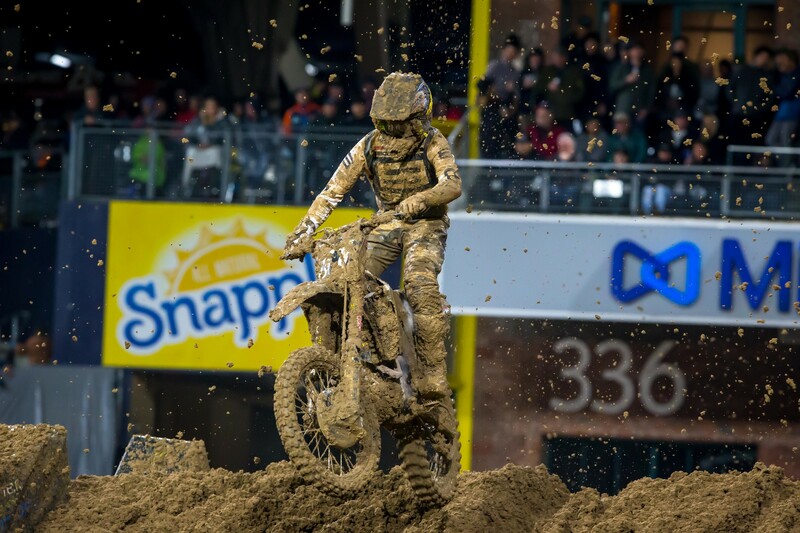 Number of career top five finishes for Chad Reed in the premier class, after he finished in fifth at San Diego. "Man, what can I say? Today was just insane with the weather conditions and the sloppy mud. For me, today was one of those days where I just felt on all day long. I had a few hectic moments in the main event, but we survived the mud, got our job done, and now we are leaving with the red plate which feels good. I am looking forward to racing back underneath a dome next week on a dry track in Minneapolis." “It was a crazy day, and a long day. We waited all day to get out and do only one practice but I was able to qualify good in third and take third in my heat race. I didn’t get a great start in the Main Event and the dirt was so heavy it was packed up in my goggles and my helmet was really heavy. I scraped my goggles on the first lap a couple times to save my roll-off and it worked until the end, which was great. “Today was a really weird day. We didn’t even get on the track until after 5 p.m. and only had the one qualifying practice. I got 12th, which wasn’t great, but the conditions were absolutely brutal. I got off to a pretty good start in the heat race and ended up winning, which was great. Going into the main and being able to pick whatever gate I wanted was huge. I got off to such a good start, it was crazy, and actually almost went down in the first turn because it was so slippery but pulled it off; then I actually went down in the second turn, which I was really bummed about. In those conditions, you don’t want to be anywhere but in the front. "There were a lot of positives for me to take away from this weekend. I got third in my heat race, which gave me a good gate pick for the main event, which is so important on a night like tonight in these muddy conditions. I got a good jump out the gate, but the mud got me on Lap 1. I didn't know what place I was in so I just put my head down, stayed calm, and tried to catch one guy at a time. I am already looking forward to next weekend."